Asgard have been producing the best in cycle storage for many years. The recent bad weather holds no fear for the owners of Asgard bike stores!!! Here are some tips on how to prepare your bike for long term winter storage. How to prepare your cycle for winter storage. When it comes to bike maintenance, there are two kinds of cyclists—those intimate with their bikes, who lovingly wash, lubricate and maintain their trusty steed throughout the cycling season—and the normal people. Do you need to lubricate the cables or chain before storing the bike? My tip is if you are not using your bike for a while – Keep everything lubricated. If you are not planning to use your bike for some months, make sure you clean your bike thoroughly! Get ALL the dirt off, dirt will rust your bike, if it becomes damp through the winter. You should always use bike specific lubricants such as GT85 and Finish line oils. These are not expensive (£7.00 for both). WD40 attracts all sorts of yukky stuff and will soon clog up your mechanism one you start cycling again. I use paint thinner (meths) to clean my chain right down, then thoroughly oil it up. This prevents any of the links from rusting or becoming stiff. You can buy a chain cleaner from ebay for around £5 that clamps to your bike and brushes your chain clean in seconds. Use plenty of oil after, then lightly rub the excess off. A drop of thin oil inside the brake lever mechanism will help to keep them in tip top shape. Preventing seizure. I then spray some GT85 on a rag and rub all the body work down, GT85 acts as a cleaning/polishing agent AND will give your bike an extra bit of protection. Should the tires be inflated or deflated? They should be inflated. They will deflate over the winter months. If you store your bike in an unheated garage you can take the tires off and bring them inside to a heated area. This will protect the rubber on the tires. Should I hang the bike up? You can hang your bike on a wall or ceiling, or just turn it upside down so there’s no weight on the tires. Will direct sunlight harm the bike? Don’t store your bike in direct sunlight. Unless your windows are new and UV protected, sunlight can dry and split the side walls of the tires. Do steel-frame bikes need any special attention in the winter months? If steel-frame bicycles are left in an unheated garage the metal can get cold enough for condensation to build up inside the tubing. This causes rusting. It’s best to store these bikes in a heated area, or pre-treat the steel frame with rust-proofing oil. Should you use an Asgard bike store you can be sure that condensation will be kept to a minimum, due to the hidden roof vents and spacious design. If in doubt, a bag of salt left in the shed/garage will absorb any moisture in the air. What about other bike bits? Take the batteries out of any lights, a little squirt of GT85 in any bike tools will keep them in good order. Make sure you wash the liner of your bike helmet to remove any bacteria (Milton Fluid is great for this) this will stop the helmet from smelling. Wash your riding shoes well. Again, any dry mud mixed with light dampness will just rot the shoes through the winter. If you are lazy or don’t have the time to do the above, simply take the bike to your local bike shop. For around £30 they will prepare your bike ready for winter, then lock it up in your bike shed and wait for the sun! Keep your bike dry and safe through the winter. Situated to the South-West of Windsor Great Park, Swinley forest comprises over 2600 acres of woodland. 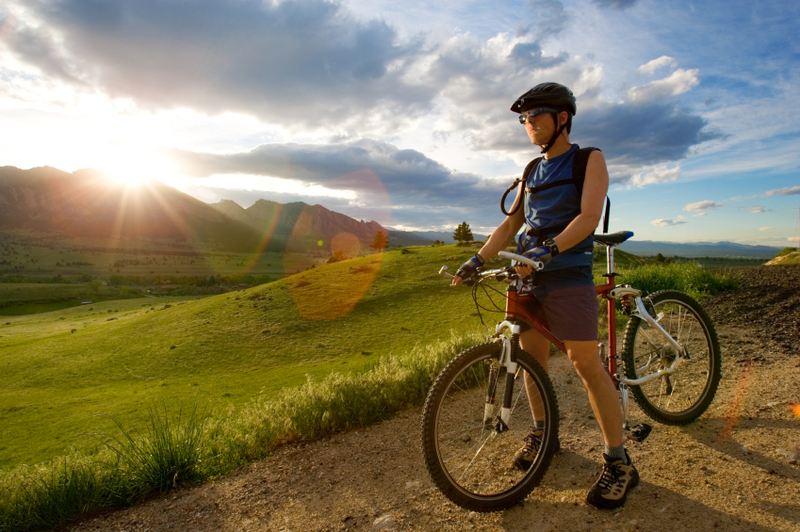 There are numerous trails to choose from so you can find one appropriate to your ability. Recently there has been a lot of investment into new facilities so it’s well worth a visit. This route takes you through quite country lanes and plenty of beautiful scenic pubs to stop at on the way. With few hills and little traffic this is a good ride for most of the family. Britain’s most popular long distance waterside cycle route passes through areas of outstanding natural beauty and features aqueducts, tunnels and historic buildings. Riders can do this in a day but less experienced cyclists can split this into 3 sections. A disused railway line, stunning ride running below the foothills of Cadair Iris and tucked away in the south of the Snowdonia national park this is an idyllic ride suitable for all the family. This route is renowned for its wildlife along the way there are “discovery posts” with information on the wildlife around that area. You could be lucky enough to spot an otter on the river bank! This is a great way to explore rural Devon. With 8 routes to choose from Grizedale is perfect for the family with lots of facilities including a bike hire shop where you can hire normal bikes as well as adult tag along bikes and trailers for young children. Once you’ve finished cycling there is a café, playground and shops. The route has fine sea views over as well as a railway path to the Giant Causeway Visitor centre which is a World Heritage site created by a volcanic eruption 60 million years ago. Refreshments and toilet facilities are available at towns throughout the route. One of the most visited tourist attractions in Scotland. 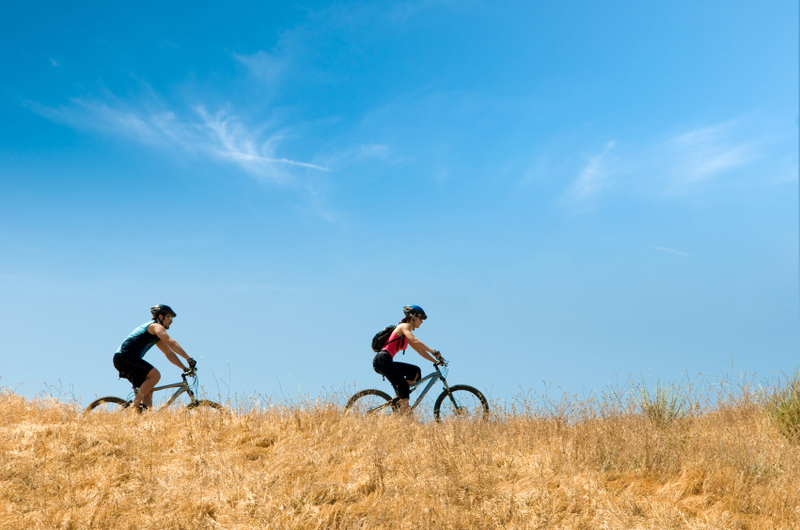 The trails are graded so it’s good for beginners as well as more experienced riders. Bikes are available for hire as well as tuition at the ‘Dirt School’ where groups are split into different abilities. Rural scenery and costal views with a few historic landmarks along the way; this route is mainly on roads with a few steep hills and is ideal for confident riders. Based on an historic railway track passes through beautiful Cornish countryside. It goes along the coast as well as through areas of forest and is relatively flat so perfect for families. It’s not always easy when you’re away from home to keep your bike secure. So take a look at one of Asgard’s bike storage units so you know your bike is safe from theft! Could cycle route logging get your bike stolen? A warning has been released by police in the Tamworth area, urging cyclists to be cautious about posting too many details about their cycle routes online. This warning has come after a spate of thefts in the area. The police have suggested that it is possible that bike thieves are logging onto cycling websites, that enthusiastic cyclists use to log their routes, bike details etc and are using this information to steal their bikes. 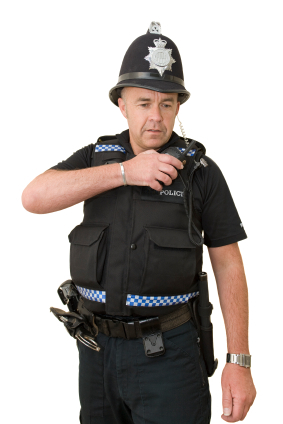 Chief Inspector Ian Coxhead said “These are sites where cyclists can log the make of their bike and upload their cycle routes as tracked by the GPS devices, which can track people back to their home, so I would be cautious about what you advertise online”. When your bike isn’t in use, make sure your bike is fully protected at home and is stored securely and safely out of sight. Asgard bike storage units offer fantastic protection for bikes. These bike sheds are all made from strong weatherproof steel panels and have been designed to help keep thieves out! These bike storage units are available in a range of shapes and sizes and if you live in a particular risky area, the Asgard high security bike store will do the trick! View the full range of Asgard bike storage and help keep your bike protected from the risk of theft. What is the best garage for bikes? If you have anything up 6 bikes, the Asgard cycle garage is the best way to store them all securely and there is still plenty of room inside for cycling accessories and bike tools. The Asgard cycle garage is made from strong weatherproof steel, for the best bike security. Asgard products all come with easy to follow step by step instructions, an installation service is also available. This bike shed is supplied with a 10 year warranty, as are all Asgard sheds. The supplied heavy duty ramp makes it easy to ride your bike straight inside the garage. The integral metal floor provides security and the supplied protective wooden floor, helps keep your bike tyres in good condition. This cycle garage includes a shelf and hooks which provide even more storage for your cycling accessories. A vented side panel is fitted in this bike shed, designed to minimise condensation. Fitted with a pick resistant lock to keep bike thieves out! This locking system provides the best security for your bike. The Asgard cycle garage has been approved by the UK Locksmiths Association. Just in time for their bank holiday sale Asgard have launched the new extra-large bike shed, the Cycle Store XXL. This metal bike shed is Asgard’s biggest bike shed to date, with massive storage space for up to 8 bikes. 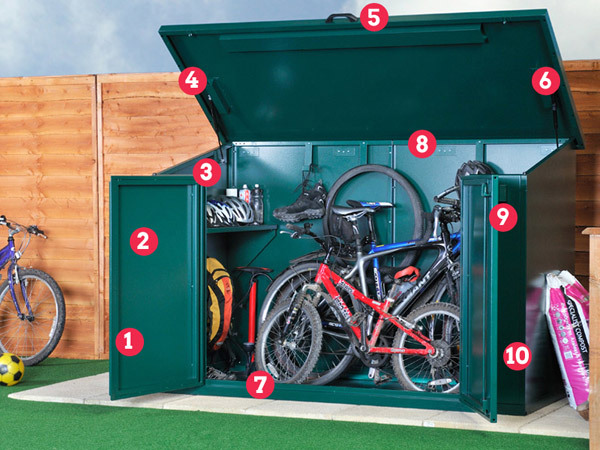 This metal bike storage unit has been designed with bike maintenance in mind, as it offers the ideal space for carrying out bike maintenance, which will come in handy when bad weather hits. 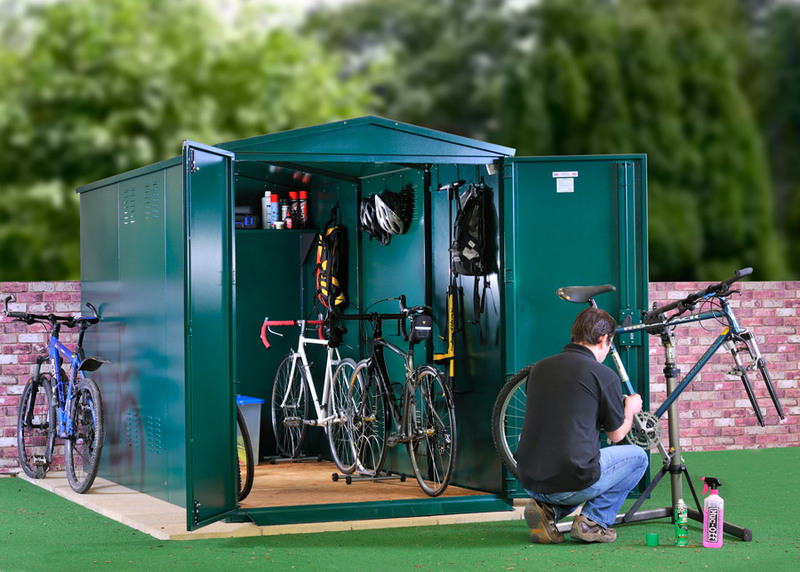 Asgard have a popular wide range of metal bike sheds and this cycle store has many of the same features, which make Asgard bike storage units so great. View the full details of the Cycle Store XXL on the Asgard website or see view their full range of bike storage units. Get 5% off Asgard products when you like them on Facebook. Offer ends Tuesday 7th May.